China won't press for new global currency at G8 - Yahoo! Finance: "China won't press for new global currency at G8"
If you haven't figured out the obvious by now - this article proves it...China is stepping up. They have tremendous potential and are developing rapidly in terms of economic growth. Makes me wonder - if the US controls approx. 40% of the entire world's wealth and China's economy is a fraction of ours...how come they are able to buy so much of our debt? Or able to loan us so much money? Why is the US the world's largest debtor and China has become the world's largest creditor? It looks as if the financial landscape is definitely changing...Robert Kiyosaki states that "the US is printing more money to solve the problem of printing more money." This is the same as the dog that tries to catch its own tail - it's not going to happen! The dog will just end up tired and frustrated (not to mention dizzy) from trying to achieve an impossible task. 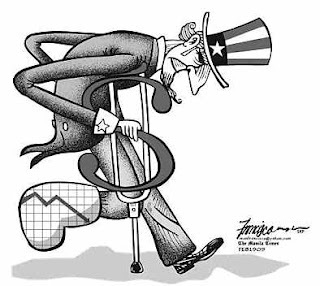 Yes - the stimulus has put a floor in place and things will probably not get as bad as they could have gotten, but as the economy attempts to recover we have inflation, or hyperinflation to worry about. Every time the government prints money to pay debts and bailout decadent auto and banking companies, it devalues the dollar - which means your savings, 401k, 529, and any other plan evaporates into thin air. Why do you think so many retirees have to go back to work in their 70s?